The SS Eagle is from the schools of Gorham & Windham, Maine and one of 5 boats sponsored by the Sebago School Alliance in southern Maine. 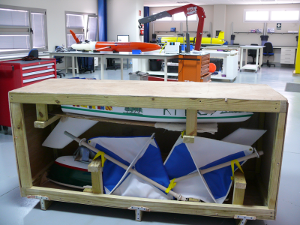 We are launching 8 boats from three different areas around the Atlantic Ocean with the goal of seeing if we can get our boats to completely circle the Atlantic and come back to the same region it started its voyage. Jan. 13, 2014 “SS Eagle” arrived safely at the PLOCAN research center in Canary Islands and then launched by Carlos Bearrea, oceanographer and local Canary Island students later in February. Unfortunately, as happened to its sister boat Glenna a few days earlier, a local wind may have blown the SS Eagle ashore before it caught the prevailing winds towards the SW. It was last heard from on 28 February several miles off Gran Canary Island but we guess that she may be resting on a rocky shore somewhere on that island or the nearby Tenerife hidden from the satellite. The Maine Boats website has a blog.